with new Tote Bin Loader and new PLC, complete overhauled. Was in use for production trials only. In like New Condition. Used machine in excellent order. - Main motor and frequent former are rebuild by Company Baumueller like new now. New Bearings on Knife shaft, new hydraulic pump, new motor and gear ring for Bowl, new ejector disc, new motors on Loading device, new Operating panel, vacuum pump Bush, new Set of Knifes and one used. Completely overhauled. Elektrik New Baumüller BKF 7000 New SPS New Panel. All Motors NEW or rebuild also Hydraulic and New Pipes for Cooking Systeme, Vacuum Pump Busch 250 extern 2 SET New Knifes. Used machine in good working order with Tote Bin Loader and two convoyer. It was in use for separating poultry carcasses. Used machine in good order. Using for poultry legs deboning. From Year 2006 in good order. In excellent order, overhauled in Oct. 2016 by Company REX. 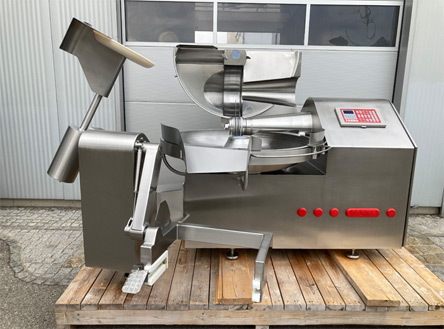 - RVF 911 - the power house: - The RVF 911 is designed for industrial use in meat-processing businesses as well as larger, sometimes highly specialized, processing units. It particular feature is its incredible filling capacity. The further increase in throughput compared with the RVF 500 and 700 Series represents the optimum solution for individual applications, but also for incorporation into complete line solutions with various clipping machines or other attachments. The housing with its smooth and hygienic design is self-supporting and made completely from stainless steel. For straight filling only. Last Service was made by Company REX in Oct. 2016. 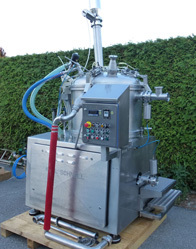 - RVF 911 - the power house: - The RVF 911 is designed for industrial use in meat-processing businesses as well as larger, sometimes highly specialized, processing units. It particular feature is its incredible filling capacity. The further increase in throughput compared with the RVF 500 and 700 Series represents the optimum solution for individual applications, but also for incorporation into complete line solutions with various clipping machines or other attachments. The housing with its smooth and hygienic design is self-supporting and made completely from stainless steel. 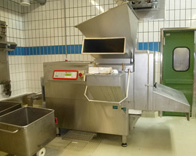 Used machine in good order with Loader and separate Vac Pump Rietschle. Used machine in good order.